Take a moment to consider the things around you. The chair you're sitting in, the device you are reading this post on, the coffee mug on your desk, the print or design on the clothing you are currently wearing. All of these things were designed by a person; a product engineer, a designer, possibly an artist. Product and surface designer and ArtMoi user Andie Hanna is one of those people. Hanna's career started in fashion design, although she has been designing and devising since she was a child. Growing up, her favourite toys were crayons, markers, paper, glue; anything she could use to make something. After a brief stint as a costume design major at the University of Cincinnati, she switched gears and enrolled at Kent State to attend the Shannon Rodgers and Jerry Silverman School of Fashion Design and Merchandising as a fashion design major. She went on to design clothing for Arizona Jean Company for JCPenney, Mossimo Girls for Target, Limited Too, and Thirty-One Gifts. She often worked with print designers to come up with fabrics for the clothing she was designing but eventually, the designers were unable to keep up with demand, "I had to learn how to do it myself. Once I learned how to create repeat patterns, I was hooked! I absolutely fell in love with it and started freelancing a bit on the side, creating prints for various print studios in New York," says Hanna. After having her son and spending 15 years in the fashion world, she was feeling burnt out and started to look for a way she could work from home. In 2012, she started a studio out of her home offering fashion, product, and surface design services. Andie Hanna's Studio. Image courtesy of the artist. Surface design is a broad term that encompasses the process of designing, dying, printing, and/or stitching a surface. This includes more obvious surfaces such as fabric, but also, in Hanna's case, calendars, journals, dishes, wrapping paper, notecards, greeting cards, scrapbook paper, stickers, coasters, and wall art. The definition of surface design also often extends into weaving, quilting, collaging, and other commonly known crafting techniques. Hanna is greatly inspired by vintage imagery, nature, and her travels, "botanicals are a huge part of my work so I love discovering new plants and flowers." She regularly references vintage fabrics, wallpaper, and illustrations for her work as well. "I am also incredibly inspired by children's books and my kids. They are so imaginative and give me so many great ideas for my novelty critters," she said. Delphine Fabric Collection by Andie Hanna for Robert Kaufman Fabrics. Image courtesy of the artist. To create her designs, Hanna has a few different processes that use both traditional and digital drawing techniques. Her work is split between botanicals and novelty designs, animals mostly. When she creates her botanical pieces she starts with a pencil. "Then I carefully ink the drawings and scan them. I use a tool in [Adobe] Illustrator called Live Trace to vectorize the scanned drawings and then I lay them out and create a repeat." Often during this process, she draws more flowers and foliage to fit in the negative space, followed again by the inking and scanning. "Once I get the layout finalized, I work on coloring the print in Illustrator. I love playing with color and seeing how different my prints can look when colored up in different ways." Pomegranate Stationery Collection by Andie Hanna for Legacy Publishing. Image courtesy of the artist. When creating her novelty prints, Hanna starts with the pencil drawing, scans it without inking, and then works on it in Illustrator. She also plays with block printing and watercolor occasionally, using Photoshop to create her repeats and to color them. For several years Hanna has exhibited at the Surtex tradeshow in New York City, which has helped get her designs seen. Surtex, a business to business marketplace for original artwork and design, allows artists and print studios to showcase their work for clients to license or buy. "I have licensed and sold my artwork to a large number of companies all over the world for all sorts of products. It's so incredibly fun and rewarding," she says. Andie's Surtex Booth, 2018. Image courtesy of the artist. When asked if she has a favorite project she's ever worked on, she had trouble deciding. "I LOVE that I get to design for so many different products and I'm not doing the same thing day in and day out," she says. "I love that I get to design and create whatever I want and then I can send it out to my clients and see if anyone wants to use it for their products. I never know where my creations will end up." You can find more of Andie Hanna's works on her website at andiehanna.com. 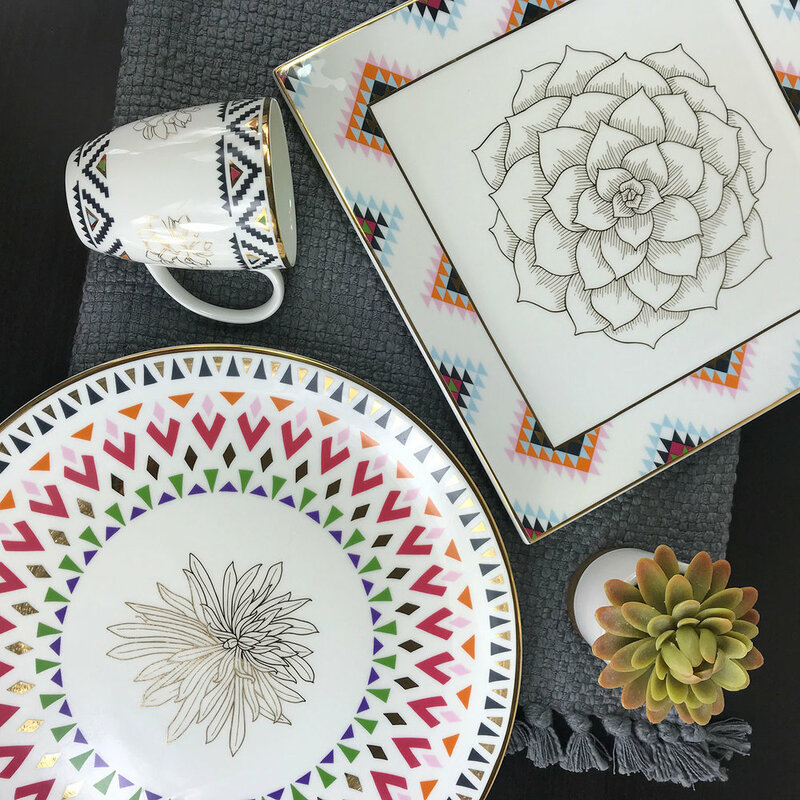 The feature image for this post is the Aztec Collection by Andie Hanna for Kika Tableware, courtesy of the artist.